DNA extraction and quality control of the extracted nucleic acid is crucial for sequencing, microarray analysis, or other genomic technologies. The CGF has established standard operating procedures for extractions to minimize degradation and contamination of precious patient samples. Quality analysis is performed with the Nanodrop ND1000 spectrophotometer, the Qubit Fluorometer, and the Agilent 2100 Bioanalyzer, which has become the industry standard for DNA quality assessment. DNA extraction tissue samples may be requested through the Hillman Tissue and Research Pathology Services (TARPS), and cell culture samples may be requested through the CGF (contact Patricia Petrosko). Fresh tissue should be flash frozen in 2.0 mL round bottom tubes or Nunc tubes in LN2 or dry-ice and maintained at -80°C until submitted to the CGF. Cells should be pelleted in 1.5-2.0 mL tubes, all supernatant removed, and then flash frozen in LN2 and maintained at -80°C until submitted to the CGF. Once samples have been extracted, they will be assessed for quality, quantity, and concentration prior to beginning microarray or sequencing assays. Samples cannot be processed until a completed Service Request Form is received along with a signed estimate. Click here for pricing information. 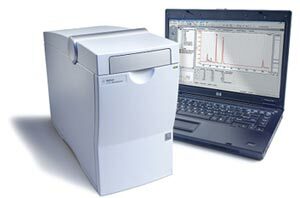 The Agilent 2100 Bioanalyzer is a microfluidics-based platform for sizing, quantification and quality control of DNA, RNA, proteins and cells on a single platform. Learn more at the Agilent website. Direct, easy measurements in less than 5 seconds – just pipette & wipe. No cuvette or dilutions! Learn more at the Nanodrop website. 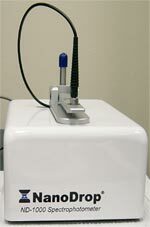 The Qubit® 3.0 Fluorometer utilizes specifically designed fluorometric technology using Molecular Probes® dyes. These fluorescent dyes emit signals ONLY when bound to specific target molecules, even in the presence of free nucleotides or degraded nucleic acids. 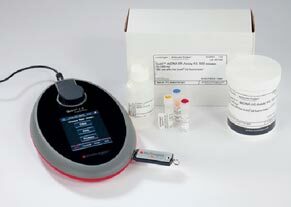 Qubit® fluorometric quantitation provides the most specific and sensitive DNA and RNA quantitation available, even at low concentrations. Learn more at the Life Technologies website.